What is Draft It Architectural Software? Draft It Architectural Software is a rich and user-friendly 2D architectural CAD platform. 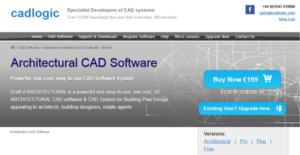 Aimed at architects, building designers, estate agents, and other building professionals, Draft It comes with a load of features but more affordable compared to similar CAD software systems. Built with the latest designing technologies, Draft It is meant to speed up the design process without sacrificing precision. Features include wall drawing capabilities, lots of architectural symbols, and an automatic 3D model viewer to name a few. Draft It also comes with a low-cost lifetime upgrade guarantee, ensuring users that they get all the new features and more without having to shell out a significant amount of money. Draft IT Architectural Software is designed to simplify and accelerate the workflows of architects, building professionals, and real estate agents. With its extensive set of design features and other capabilities, you can design anything without breaking a sweat. Draft IT is a dependable and user-friendly CAD software that has all the tools you need to quickly whip up great building designs and make the necessary changes if required. If your clients have complicated design requirements, you can count on Draft It to help you create plans that meet, or even surpass, their expectations. With Draft IT Architectural Software, you can build walls with ease. It is loaded with hundreds of architectural design elements that you need for your work. Whether you need to incorporate furniture into your plans, add a fixture to your rooms, create layouts for your plumbing, the software simply has all the elements. Need to get a better view of your designs? Draft IT offers an automatic 3D model viewer feature that lets you view and rotate 3D models generated from your plans. You can zoom in and out, as well as pan around using your mouse to assess your designs and see what needs to be improved or changed. If you are interested in Draft It Architectural Software it could also be a good idea to investigate other subcategories of Best Architecture Software listed in our database of B2B software reviews. Since each enterprise has unique business wants, it is prudent for them to abstain from looking for a one-size-fits-all perfect software system. Needless to say, it would be futile to try to find such a platform even among widely used software platforms. The intelligent thing to do would be to catalog the various essential elements that require consideration such as required features, budget, skill levels of employees, company size etc. Then, you should do your research thoroughly. Read some Draft It Architectural Software reviews and check out each of the other apps in your shortlist in detail. Such exhaustive research can ensure you weed out ill-fitting applications and zero in on the app that provides all the aspects you require for business success. How Much Does Draft It Architectural Software Cost? We realize that when you make a decision to buy Architecture Software it’s important not only to see how experts evaluate it in their reviews, but also to find out if the real people and companies that buy it are actually satisfied with the product. That’s why we’ve created our behavior-based Customer Satisfaction Algorithm™ that gathers customer reviews, comments and Draft It Architectural Software reviews across a wide range of social media sites. The data is then presented in an easy to digest form showing how many people had positive and negative experience with Draft It Architectural Software. With that information at hand you should be equipped to make an informed buying decision that you won’t regret. What are Draft It Architectural Software pricing details? What integrations are available for Draft It Architectural Software? If you need more information about Draft It Architectural Software or you simply have a question let us know what you need and we’ll forward your request directly to the vendor.